IsolationPoint - Free Trial Download! IsolationPoint software is a lockout tagout / isolation procedure program. IsolationPoint lockout tagout software allows you to start simple yet it incorporates the latest in plant isolation technology. IsolationPoint isolation procedure software is different because you can add isolation points, assemble procedures and either print isolation procedures for execution or use a PDA with barcode or RFID scanning technology to execute energy isolation procedures. This feature delivers unrivaled equipment lockout, accuracy and efficiency. An energy isolation procedure provides a worker with a sequence of actions that will remove all sources of energy from plant or equipment. Once energy sources have been disconnected, workers can safely access the plant or equipment without fear of it starting unexpectedly. IsolationPoint lockout tagout program delivers high accuracy, hence safe, equipment isolations while reducing their execution time. IsolationPoint isolation procedure program manages all phases of an isolation procedure's lifecycle. Put simply, it manages the development, execution, archiving and reporting of safety isolation procedures. Safer plant / equipment isolations - Uses human and machine methods ( barcode / RFID scanning ) to provide independent identity verification of isolation points to be operated. In essence, it provides cross checking with only one Isolation Officer! Faster execution of isolation procedures yielding reduced costs - Visual aids are incorporated that communicate where to look, what to look for and what to do in relation to an isolation point. Simpler procedures mean improvements to speed and accuracy while reducing the need for highly trained Isolation Officers. Low administration overhead yielding reduced costs - Procedure self auditing, archiving, average time to execute and lock and tag reporting are incorporated to reduce administrative overhead while providing useful information to aid future maintenance / shutdown lockout tagout planning. High integrity machine isolation through security - The use of multiple user types controls who can compile, modify and execute isolation procedures. This ensures that only trained operators can perform those tasks for which they have the relevant competencies. System Flexibility - The Server/Client architecture allows system expansion to accommodate the most demanding multi-operator applications. System Reliability - Data integrity is enhanced through the use of error checking algorithms so as to identify any isolation procedure inconsistencies should they eventuate. IsolationPoint comprises one Server (Personal Computer) and one or more Client PDAs (Personal Digital Assistants). The IsolationPoint Server is used to compile, store, archive and report isolation plans. The IsolationPoint Clients are used to execute isolation plans. Isolation Officers perform Isolation Procedures in the plant by following a PDA based procedure rather than a printed, paper based procedure. Plan Library - A collection of Isolation Procedures compiled by site Isolation Plan Authors (authors) that can be used as templates for future isolation procedures. Active Plan List - A collection of Active Isolation Procedures copied from the Plan Library, when activated by site Isolation Officers (executors) on an as need basis. 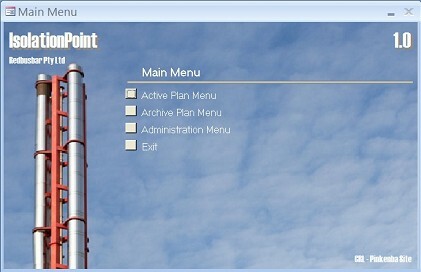 The Active Plan List incorporates one or more plans. When the plan is first copied, isolation progress is blank. Following execution of the plan, isolation progress is complete. Accurate Isolations - Usage of two different methods ( text and barcode / RFID scanning ) to identify isolation points removes the likelihood of common cause identification failures. Executor Authorisations - Only specific executors can execute isolations for which they have been trained to perform. Eliminate Administration - There is no need for manual data entry of the completed isolation plans, transcription errors are non-existent and there is simply no paperwork to file. Convenience - Several active isolation plans can reside on the Client PDA at any one time. A plan can be started, interrupted to swap to another plan and swapped back to complete at a later stage. Eliminate Errors - There is no risk of printing a multi page isolation procedure and losing a page / running out of paper and the possible skipping of vital steps in the plan. While IsolationPoint is built to take advantage of the Client PDA, authorised personnel can print activated plans, execute the paper based plans and manually key in execution progress. These provisions accommodate a lack of Client PDA availability eg loss, damage. Alternatively, a low cost isolation management system can be implemented if your budget is limited. Trial Version - Ten hours cumulative use. No expiration date. Scroll to the bottom of this page where you will find the product "IsolationPoint Server Trial Version". Just click "Buy Now" and proceed through the Checkout as it won't cost you a cent! We will process your order and send you an email that contains a link to a secure download location. Download, unzip, install and enjoy! License Version - Licensed on a per Point basis. There is no limit to the number of Plans. Each Point may be used in several Plans. No expiration date. A one year maintenance support is included with each new purchase entitling the user to free software upgrades during the maintenance support period. Contact Us for your copy of IsolationPoint Server - Trial Version and License Pricing. Trial Version - Ten hours cumulative use. No expiration date. License Version - Unlimited use. No expiration date. Contact Us for your copy of IsolationPoint Client - Trial Version and License Pricing. The IsolationPoint Server Trial Version allows a user to try a working copy of IsolationPoint Server. The Trial Version allows mostly the same functionality as the Licensed Version, however the Trial Version is limited to 10 hours of use before expiry. Go ahead - Click "Buy Now". It won't cost you a cent! You will be directed to setup an account, assuming you're not logged in already, incorporating a shipping address so that we know you're a human!